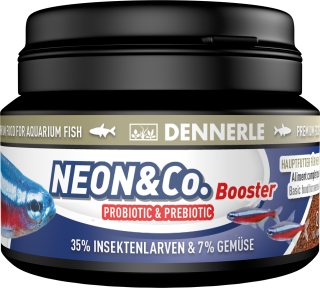 ​​​​​​​Staple food for Neon tetras and other small ornamental fish such as tetras, barbs, danios or guppies. The fine granulate material consists of many high quality ingredients such as Krill (13%) and insects (35%), and algae (1%) as well as vegetables (7%) and thus ensure a balanced diet. Rich in astaxanthin the fine food bites promote the full expression of species-specific colors.